A formation of Chinese naval ships consisting of four advanced warships under the People's Liberation Army (PLA) Southern Theater Command's South China Sea Fleet set sail Wednesday for deepwater exercises with the PLA's Air Force, Rocket Force and Strategic Support Force. The PLA forces will conduct joint exercises focusing on anti-terrorism, anti-piracy and joint search and rescue missions under real combat scenarios, the South China Sea Fleet announced in a statement released on its WeChat account on Thursday. 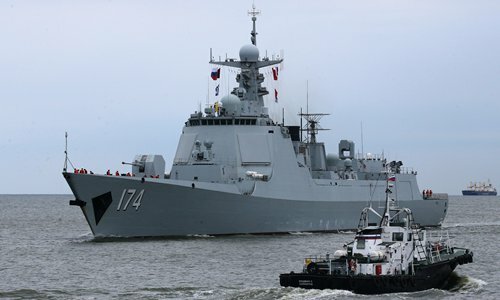 The four vessels participating in the drill, the Type 052D guided missile destroyer Hefei, the Type 054A guided missile frigate Yuncheng, the Type 071 amphibious transport dock Changbaishan and the Type 903A supply ship Honghu, are PLA Navy's new battle vessels, the statement said. The Navy's "deep integration and joint exercise with other military branches like the Air Force, the Rocket Force and the Strategic Support Force are the highlights of this far-sea joint drill," the statement said quoting an unnamed leader of the formation. Testing and research on these subjects will be the main focus of the exercises, said the leader. These offshore drills are routine and in accordance with the PLA Southern Theater Command's annual plan. It conforms to related international laws and conventions and is not aimed at any specific country or target, reads the statement. The statement did not disclose where the drills would take place or how long they will last. Last year's far-sea drill of the South China Sea Fleet took place in February and lasted 25 days, as vessels conducted exercises in the South China Sea, East Indian Ocean and West Pacific Ocean, the PLA Daily reported.